The Royal Canadian Mint issues the Canadian Maple Leaf coins in four popular weights each year. While the Gold Maple Leaf and Silver Maple Leaf are regularly issued, the Platinum Maple Leaf and Palladium Maple Leaf have experienced stoppages at various times. Recently though, both coins are available alongside the gold and silver versions. The 2019 1 oz Platinum Canadian Maple Leaf Coin is currently available to you for purchase online at Silver.com. Coins ship to you inside of individual flips or protective mint tubes of 10 coins! 22nd release of the Platinum Canadian Maple Leaf coin! Light-diffracting radial lines and a laser-engraved maple leaf privy. The Platinum Canadian Maple Leaf coin was first issued in 1988 alongside the release of the popular Silver Canadian Maple Leaf. From 1988 to 1993, the Platinum Maple Leaf was issued by the Royal Canadian Mint in 1 oz, 1/2 oz, 1/4 oz, and 1/10 oz weights. In 1994, a 1/15 and 1/20 oz weight were added, though the 1/15 was part of the 15th anniversary of the Maple Leaf Series and only available that year. Platinum Maple Leafs were issued regularly through 1999, once in 2002, and then not again until 2009. 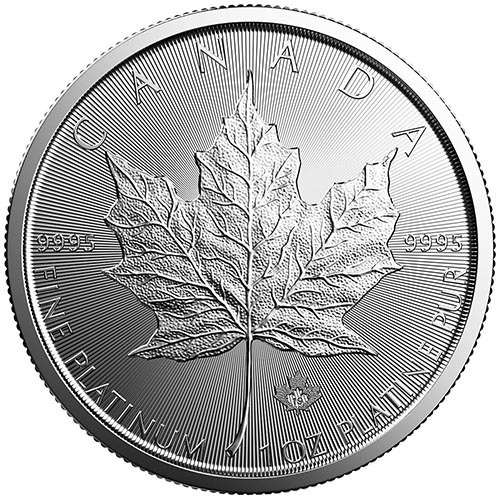 Since 2009, the Platinum Canadian Maple Leaf has been issued only in the 1 oz weight. The coins, as of 2015, feature the Royal Canadian Mint’s latest protective technologies. The laser-engraved maple leaf privy features on the reverse with the date mark’s final two digits inside. There are also light-diffracting radial lines on both sides of the coin. 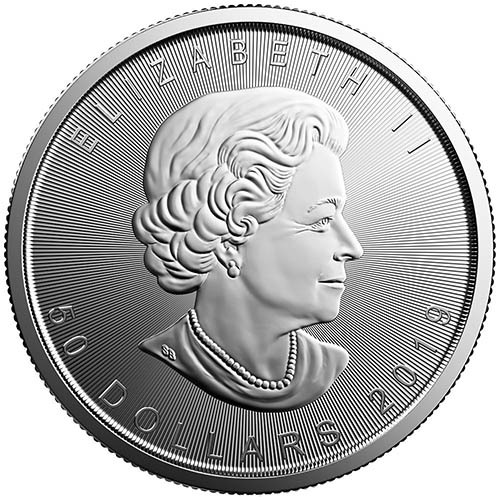 On the obverse of 2019 Platinum Canadian Maple Leaf coins is the right-profile portrait of Queen Elizabeth II. Introduced in 2002, this design from Susanna Blunt is the fourth-generation image of the Queen and the first since the reign of her father George VI not to feature a crown on the monarch. The reverse of 2019 1 oz Platinum Canadian Maple Leaf coins features the sugar maple leaf. This design is used on all versions of the Canadian Maple Leaf coinage and was designed in 1979 by Walter Ott for the debut of the Gold Canadian Maple Leaf. We encourage all Silver.com customers to reach out to us with questions about platinum coins. You can call us on the phone at 888-989-7223 or connect with us online. Those options include a live web chat service and our email address.